For the vaudeville star, Joseph Thuma Schenck (1891–1930), see Van and Schenck. 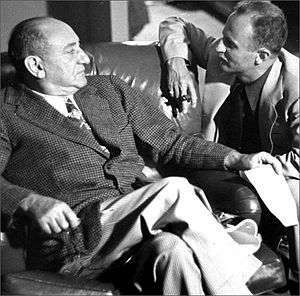 Joseph Michael Schenck (/ˈskɛŋk/; December 25, 1878 – October 22, 1961) was an American film studio executive. Schenck was born in Rybinsk, Yaroslavl Oblast, Russia, to Jewish parents. He and his family – including younger brother Nicholas – emigrated to New York City in 1893, he and Nicholas eventually got into the entertainment business operating concessions at New York's Fort George Amusement Park. Recognizing the potential, in 1909 the Schenck brothers purchased Palisades Amusement Park and after that became participants in the fledgling motion picture industry as partners with Marcus Loew, operating a chain of movie theaters. In 1916, Through his involvement in the film business, Joseph Schenck met and married Norma Talmadge, a top young star with Vitagraph Studios. He would be the first of her three husbands, but she was his only wife. Schenk supervised, controlled and nurtured her career in alliance with her mother. In 1917, the couple formed the Norma Talmadge Film Corporation, which became a lucrative enterprise. The couple divorced in 1934 and Schenck then built a home in Palm Springs, California. The Political Graveyard reports that he was an alternate delegate to the 1928 Republican National Convention from California. In 1933 he partnered with Darryl F. Zanuck to create Twentieth Century Pictures that merged with Fox Film Corporation in 1935. As chairman of the new 20th Century Fox he was one of the most powerful and influential people in the film business. Caught in a payoff scheme to buy peace with the militant unions, he was convicted of income tax evasion and spent time in prison before being granted a presidential pardon. Following his release, he returned to 20th Century Fox where he became infatuated with a young actress named Marilyn Monroe and played a key role in launching her career. One of the founders of the Academy of Motion Picture Arts and Sciences, in 1952 he was given a special Academy Award in recognition of his contribution to the development of the film industry. He has a star on the Hollywood Walk of Fame at 6757 Hollywood Blvd. Schenck retired in 1957 and shortly after suffered a stroke from which he never fully recovered. He died in Los Angeles in 1961 at the age of 82 and was interred in Maimonides Cemetery in Brooklyn, New York. 1 2 Basinger, Jeanine (2000). Silent Stars. Wesleyan University Press. p. 144. ISBN 0-8195-6451-6. ↑ Meeks, Eric G. (2012). The Best Guide Ever to Palm Springs Celebrity Homes. Horatio Limburger Oglethorpe. p. 163. ISBN 978-1479328598. ↑ Schickel, Richard. D.W. Griffith His Life and Work, 1985. Wikimedia Commons has media related to Joseph M. Schenck.